I did it! I finished. phew. It was quite a day of speed-quilting yesterday. Oscar took 2 looong naps yesterday and I was able to baste it together, do all the quilting and make and sew on the trim! I think Oscar has realized it’s cold and snowy and we’re not going out for walks to the park or library so he might as well sleep all day. Poor guy, we’ll have to brave the cold today and go out as a reward for him being so good yesterday. I really like how it turned out! At first I was disappointed because the design I had conceived of originally didn’t work out. I wanted a more modern, less traditional quilt with lots of white space and random splattering of squares. But I couldn’t narrow down the squares to use to so few – Oscar had so many cute little outfits and I want to remember all of them. So we came up with this instead and I think it worked out great! The white squares are flannel, as in the trim. And the backing is striped knit jersey. There are some wonky bits. Actually a lot of them. I might have been able to do a better job with the quilting if I wasn’t in such a hurry but I don’t know. It’s so tricky to do the center with the entire quilt jammed in the sewing machine. And I always finish these things in a hurry whether or not I am because it’s kind of tedious. Wavy lines and puckers aside this is my favorite quilt ever!! It is so soft and, what’s a good word, malleable? You know how quilts can be stiff? Well since this one has knit jersey front and back it’s really flexible. I hope Oscar likes it and adopts it as his blankie. Although maybe it’s for me…flash forward 18 years, Oscar’s just gone off to college, I’m in bed curled up in a ball inside this quilt hugging Kanga. Your quilt is so nice. It’s a wonderful idea to remember all the cute outfits your baby wore. Hope Oscar will like it. A beautiful little boy with two VERY talented parents! Nice quilt; nice web site! Beautiful – that’s such a great idea! I recognize so many of those panels from my kiddo’s old clothes, too! Hi HIllary: I don’t know if I like Oscar’s baby quilt more or the pictures of Oscar wearing his clothes. Great job! If I could just harness some of your energy I could get some projects done, too. That is such a cute quilt and a great idea. I wouldn’t worry about the flaws, I always think that too, but nobody ever notices them as much as I do. I’m impressed that it lays so flat, considering how many different kinds of fabric you must have used. Nice job! That’s beautiful! What a sweet idea! Great idea and quilt – and don’t stress about the flaws. After completing my first quilt a few years ago and realizing that I had created a major error, a friend told me that there is an African saying regarding that a piece of art is not perfect until it has a mistake. Or something like that…that was how I like to remember it. Hillary, Oh My GOODNESS, you are amazing! I love the quilt, wonkiness and all (that is the charm of handmade, seriously!). And those pics of Oscar in his clothes pre-quilt are adorable. He is the darlingest little darling! Is that a London Underground symbol in the middle of the quilt? Cute! quite a quilt hillary! my sister n law’s grandma made her a quilt using all of laurie’s old tshirts. i think the idea is fantastic. i’d like to quilt with paper someday. Oh my goodness, your Oscar has the sweetest ears! Envy! Envy! 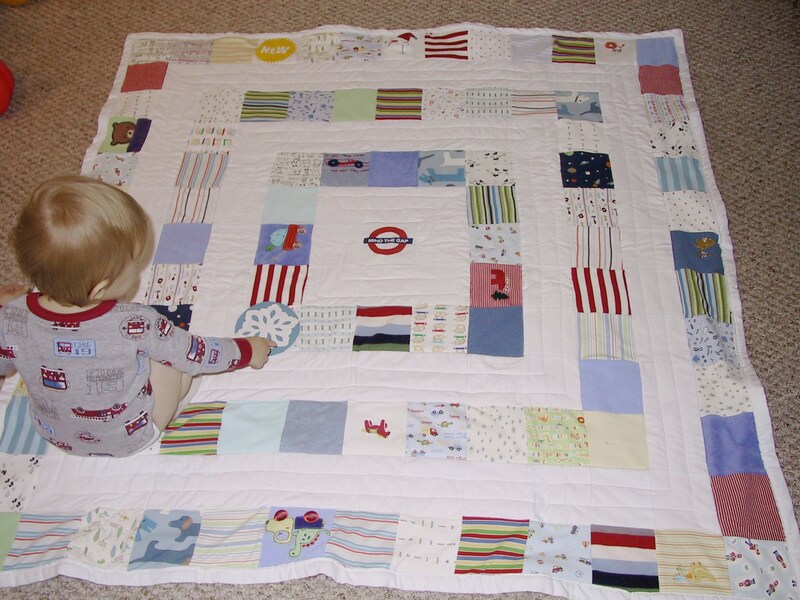 Cutest baby quilt ever! I have to chime in to say how great your quilt is. It’s extra nice that you took the time to show us Oscar in all the corresponding outfits. Congratulations on it and I hope it brings you all lots of happy memories for a long time! Very cute! I’m sure it will be his favorite quilt/blanket/covering. As for the wonky parts, those are what make the quilt special and unique (and I don’t really believe that you do anything wonkily). what I am is good at editing pics to not show the swerves and puckers 😉 Thanks everybody for all the nice comments!! And for reassuring me about the wonkiness. I always have these moments of regret when I finish things. When I wish I’d taken my time and been more careful and done a nicer job. Especially when my sewing machine is involved. I’m just too impatient! The end comes in sight and I get so excited. Your quilt is so very sweet! I love how bright it looks. Are all of the colored squares from clothing, or did you use other fabric for that too? Adorable quilt for an adorable boy! Does the middle block with the red circle say Oscar? Was that also from one of his outfits? 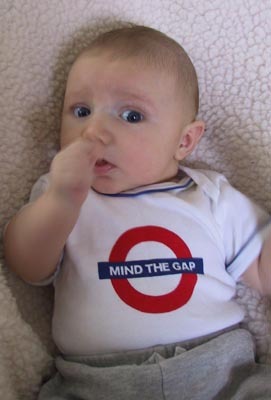 that’s his Mind the Gap (London Underground) onesie that his Grandma brought him from her trip abroad. hillary – it looks great! and you know, i think it looks pretty “modern” even in a somewhat more traditional layout than you were hoping for. there is an old quilt from my grandma made out of my mom and her sister’s clothes from when they were kids (some of which i wound up with years later made into new outfits) and it’s one of the most cherished things in my mom’s entire basket of cherished things, i’m sure oscar is going to love it now and in years to come he’ll have something to hand down to his children!!! turned out beautiful – wonky seams are part of the fact that it’s hand made with your love!!! oh my god i love it!!! awesome. its so cute to see him in all the outfits too. Oscar’s quilt is so cute, you did a great job! I am consistently awed by your talent! I’m so impressed that you actually completed this. I have 3 kids and I made several things for my first born, just a few for my second, and very little for my third; it gets away from you so easily. I’ll attempt this some day because being the packrat that I am, I still have lots of their baby clothes. i haven’t posted in your journal in a while, but i can’t help it when i see your adorable quilts. they are just so wonderful. this one is especially beautiful and so meaningful!! great job. i can’t wait to have a baby just to do this to their clothes when they grow out of them!!! haha. and what an adorable little man youve got! You used a perfect design to show off all of those sentimental fabrics. My eyes was to go around and around those squares like a gameboard! 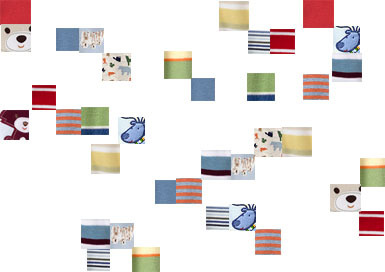 Did I mention that Nani Iro is coming out with new fabrics sometime soon…. What a beautiful quilt! It always amazes me how such a simple pattern can look so good, just based on fabric choices and placement. I need to start making more quilts like that, and stop attempting these motha-projects that take me forever, and I end up hating by the time I finish…if I ever do finish. Question…do you have any advice on working with the jersey fabric? Doesn’t it stretch all to heck? how did you do it? Love love LOVE It. Just got rid of a ton of baby clothes but kept certain things — now I know why. Beautiful quilt! You did a great job!…and those pics of Oscar…so adorable! What a brilliant, brilliant idea. And it turned out beautifully. you make the cutest things that i’ve seen in a long time. Hillary-Kay (above) sent me to see your quilt. So fantastic! Can’t get over how lively and modern it is. We are having Covetous Thoughts. Beautiful quilt! How big are the squares you used? How big is the whole quilt? i adore your quilt (idea and finished product)! I just came across your page while searching for quilt ideas for my kids, and I fell in love with Oscar’s quilt! I, also, am wondering how large it is and how large the individual squares are? I love the quilt you made with Oscar’s baby clothes! I think you did a beautiful job. I have been wanting to make some fun quilts (much like yours) out of my daughters’ baby clothes, but I am fairly new to quilting and am wondering if it is difficult to make quilts out of baby clothes vs. typical quilting fabric; since so many baby clothes are knit/jersey vs. a weave, is the stretchiness a problem… You know what I mean? Any tips you can share? Any special product to use? thank you so much for the great idea! i have been saving my 3 boys’ baby clothes for years wanting to make a quilt out of them for their children. i love your idea of using small patches of clothing on a flannel background. i couldn’t quite figure out how to make all their clothes stretch for 3 quilts! I don’t know how old this site is, but I LOVE your quilt!! It’s got perfect simplicity to it. It allows you to appreciate each fabric. Okay, You were way to organized to have the pics of Oscar in each outfit! How beautiful…the thought of Oscar going off to college and his mommy hugging this beautiful quilt made of his little clothes made me cry. I have three little one of my own and am planning to make them each a quilt. Right now i’m in making my 5 yr old daughter’s first quilt…. This is an amazing quilt and story! I love the pictures too! You have totally inspired me…the baby clothes are getting washed in hot water, and I was looking for a pattern. I love the idea of the white blocks so it’s not too busy and you can really appreciate the cute little prints…Thanks to you, I am ready to start today! Yeah! This is such a wonderful idea. You will treasure this quilt so much, and I am sure he will too. Oh! What a fantastic idea! Two minutes ago I was in mourning over the fact that my second daughter (11 weeks) is already growing out of those gorgeous suits which my first daughter (3 years) was only wearing not that long ago (surely!) — you have provided inspiration for not only a gorgeous soft quilt but a way of keeping those precious suits without wasting space or feeling guilty about hanging onto clothes someone could be using. Becky just shared this with us… it’s gorgeous! well I just sort of jumped into this project, I didn’t use anything to stabilize the fabrics and I just put the outfits down on my cutting board and went at them with a ruler and a rotary cutter. Your quilt is wonderful! This is exactly what I want to do with my children’s clothes. My son is almost five and I still have all the little clothes I want to make his quilt with I just do not know how to make one! Yours is wonderful though! Love the quilt! I have been saving my kids’ clothes to do this very thing and I love this pattern. How big are the squares? 3×3? Were there any fabrics that you found you couldn’t use? Thanks for the inspiration and any help you are willing to offer.